Basement progress hasn’t been quick, but with a down-to-the-studs starting point, I guess that’s only natural. It’s been a while since the last update, so here’s a run down of the changes made. Directly ahead from the base of the stairs and garage door is the mud nook with the bedroom beyond. We spent two weekends hanging sheetrock before hiring a crew to tape, mud, sand, and prime to avoid getting bogged down. Money well spent, if you ask us. Right after they finished, we laid slate tiles in a herringbone pattern (same as the kitchen). Next, Ben hung doors and installed baseboards, crown, and door trim while I filled, caulked, and painted doors. With all the trim filled, I spent most of my waking hours painting. Just painting away. First trim, then walls. We carried the same paint from the main level down the stairs, and into the hallway. In the south facing bedroom, I wanted to use a bolder color. Something to break up all of the neutrals in the adjoining spaces. Enter Templeton Gray from Benjamin Moore. It reminds me of dark and stormy skies; blue with enough gray to keep it from feeling bright. Depending on the lighting, it can look gray or blue. A color that can easily pair with golds, mustard yellows, navy, wood tones, and my favorite-green. Bedroom and closet doors are waiting in the wings, ready to install soon. Back out in the hall, the first door leads to the laundry room. To save space, we installed a pocket door, and modified the trim to fit the lowered ceilings. Let’s continue down the hall, toward the theater room. Duct work runs the length of the hall, lowering the ceilings by about one foot. In an effort to minimize the height difference, I carried the wall color up to the ceiling. Down in the theater, the duct continues through part of the room. 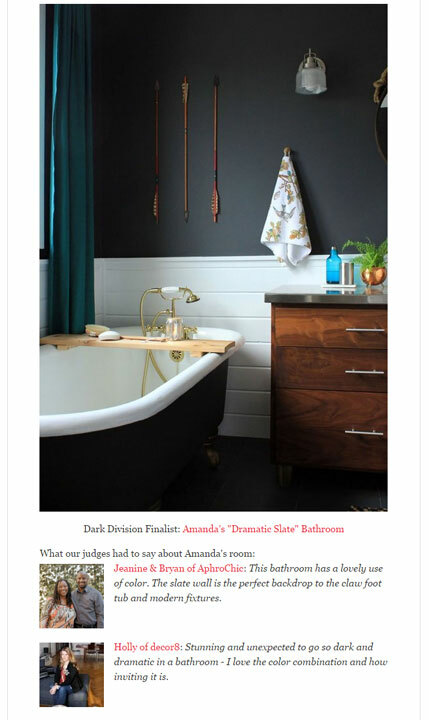 To create a dark, enveloping room, I chose a deep green for the walls, Jasper from Sherwin Williams, in a flat finish. As with the hall, the color continues onto the lowered ceiling. Eventually, we’ll mount the TV to the wall with a cabinet below. This shot is the most accurate color representation. It’s exactly what I hoped for, dark enough, but still looks green. Carpet samples are on their way here so we can decide on a color before ordering. Once carpet is in, we can officially start using these rooms! Thanks to the configuration, we had to make the theater door swing into the hall to avoid a door awkwardly sticking out. Through that door is a storage space, which would be a closet if used as a bedroom. Looking back down the hall, the doorway on the left is the bathroom, laundry after that, and mechanical straight ahead. And the nearly after view, minus missing carpet and lights until the paint has cured. I’ve got ideas swirling in my head for furniture and accessories, which I can’t wait to get a start on. Wow! That is beautiful! Great job! It’s looking good. You’ve come a long way! So nice to see a pocket door instead of the sliding barn door. I know the barn door is trendy, but the pocket door is classic! Can’t wait to see another progress post. Have a great weekend! Agreed about the pocket door vs barn door! And the basement is looking amazing! Thank you so, so much, Ashley! Looking good! Can you show a closer picture of the crown molding in the blue guest room? We’re redoing our trimwork in the house and I’m scouring for pictures of crown with the craftsman style door/window trim.